End of year celebration and other info. Written by Ameera on 09 November 2017 . Remember there is no class on 14th November as the school has got an opening evening. The last class of the year is 12th December 2017. As agreed with the students who attended the class last tuesday,and for those who wish, we will go after the last class for a drin or/and food at the Unicorn (the usual place). the last class will be 9th December 2017 and after we will go to the Turkish restaurant Pasha. A table has been reserved for 12midday. If you wish to attend the meal after the class, please email me or text me on 07971847694 (please say who you are in your text) by 19th november 2017. Written by Ameera on 20 May 2016 . Bring a small exotic dish to share. Performance platform with gorgeous dancers. Written by Ameera on 13 October 2015 . Performance platform with gorgeous dancers. And plenty of time for you to boogie to hypnotic Arabic sounds. Bring your partner, bring your friends! A party you don’t want to miss! …and for the belly dancers, a workshop on double veils - 4.30pm-6.30pm – suitable for those with previous veil dance experience – learn tips and tricks to wow your audience – bring 2 veils preferably the same size. Party+ workshop £15 by 1st November / £20 thereafter – 10% disc for 10-class card holders. Sara Farouk at Shimmy Cocktail this June! Written by Ameera on 15 January 2015 . With the world renowned belly dance teacher and choreographer Sara Farouk, based in Cairo. Dancers, pm me if you would like to be in the showcase as well. Groups/solos 4 minutes max. *10% discount for 10-class card holders on all day package. There's a Travelodge hotel walking distance to the venue for those of you who would like to stay on the night. Here's the website http://www.travelodge.co.uk/ look for Travelodge Plymouth Derriford Hotel. Sara Farouk is an international teacher and choreographer with her own unique style and take on things. An inspiration to many dancers in the UK, she has a wealth of knowledge and insight into Egyptian music, dance and life in Egypt where she has lived for many years. She also works with the renowned Eman Zaki and Randa Kamel. She arranges dance holidays and events in Egypt. Rio, a lover of all Latin and Urban dances, has been teaching Samba for the past 6 years. Rio can be seen performing in carnivals all over the South West. Dan is a world percussionist based in Cornwall. He specializes in playing the Darbuka, incorporating a wide range of musicality, technique & flare. He has 10 years experience & a creative authentic understanding of the instrument. Azeezah (Paula Haines) started ballet from the age of five and throughout her life enjoyed a different range of dance styles, until 12 years ago when she fell in love with Egyptian Dance. Azeezah loves teaching and enjoys watching the confidence and self esteem that grows within each student. Your ticket is transferable to another person found by yourself. After 1st May 2015, no refund. 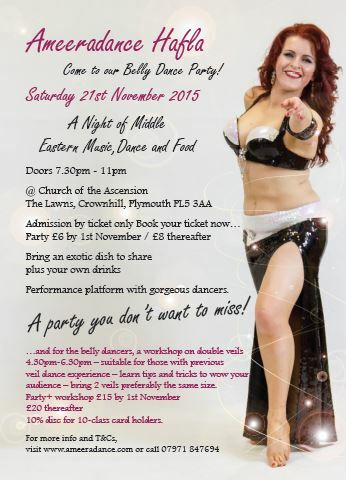 Join us on a fun filled luxury bellydance spa break by the sea. We hope to have enough dancing to keep you happy plus time for indulgence in some non dance activities like pampering yourself in the spa or maybe a swim in the outdoor or indoor poole and then a quick sauna and jacuzzi. Sound good?